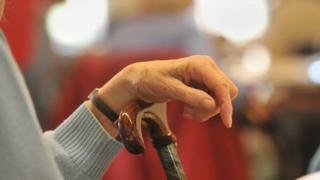 The government wants to see England become one of the best in the world at looking after the elderly. Key to achieving that ambition is the help the elderly are given at home for activities such as washing and dressing and the quality of services they receive in care homes. But the services - overseen by councils - are on their knees, it is said, with fewer and fewer people being given the help they need. It means many of the most vulnerable older people are being faced with a choice - pay for the help themselves or go without. Health Secretary Jeremy Hunt has given his backing to a proposal - put forward by the independent Dilnot Commission last year - to cap the amount people will have to pay out of their own pockets, saying he wants it to be introduced "as soon as we are able". But is this the answer to the problems? Older people have waited long enough. We must reform the farce that is our current system for funding long-term care. Dilnot is right - capping individual liability for care costs makes sense. It will help end the appalling unfairness that sees some older people facing catastrophic care costs. I was encouraged by Jeremy Hunt's pledge to implement the Dilnot cap. The concern is that could be years away. Hunt needs to be bold. Resolving the current mess and finding an affordable solution for the future will not be easy and Dilnot is only the start. But our ageing population and the future generations of older people will remember the person that takes a stand and resolves this issue. While local authority and health budgets remain separate there is little financial incentive to prioritise services that prevent the need for more expensive NHS treatment. I hope that Social Care Minister Norman Lamb is of a similar view, but again my fear is how long it will take to progress any real change. David Rogers, of the Local Government Association, described social care as the most important issue this country is facing and one which is growing in magnitude - so why is so little being done? Perhaps a clue comes from Anchor research showing one in four people is unaware that social care is means-tested. Huge numbers don't know there's a problem until it affects them directly. This has fuelled the short-term thinking of successive governments. Demographic change means we're all more likely to need care in later life yet government has failed to prepare for it or ensure individuals are able to do so. It's time for the coalition to respond to Anchor's Grey Pride campaign by appointing a Minister for Older People to ensure that the impact of our ageing society is properly addressed at cabinet level. Age UK was delighted to hear Jeremy Hunt talk of creating a social care system fit for an ageing population. There is much to do to meet this aim. The current care system is unfair and unfit for purpose. It is a postcode lottery in which those hit hardest by ill health, disability or dementia have to pay the most. Older people already dealing with the emotional impact of moving into a care home then face the often heartbreaking and unavoidable prospect of selling the family home to pay for their care. The recommendations of the Dilnot Commission would, if implemented, help lift that worry from the last years of life by setting a limit on how much an individual would have to pay towards their care. A lifetime cap at the level recommended by Dilnot of £35,000 would help people plan - whether that is by putting aside money or buying an insurance product. Age UK wants to see the government announce as soon as possible the funding necessary to make the recommendations a reality - the longer it delays, the higher the initial costs will be. There remains a question, though, over closing the spending gap in the system. Spending cuts combined with a rising number of older people created a £500,000 shortfall last year compared with 2010 spending levels. This means that more older people are losing access to care and support services and being forced to struggle on alone. For example, David, 76, who was recently told that although he uses a wheelchair, with little use of his hands and has to have help in washing, getting to bed and many other basic tasks, he was no longer able to attend his local day centre because he was not disabled enough. To create a social care system fit for an ageing population means ensuring that people like David receive the support they need at a vulnerable time of life. The care system is in crisis and the way it is funded urgently needs reform. Yet we are seemingly no nearer reaching a solution over two years after the coalition government resolved to do so. The Dilnot Commission's recommendations published in July 2011 are increasingly seen as answering the wrong question at the wrong time. Rather than address growing unmet care needs, Dilnot tackled this issue: how to stop older people having to sell their home to pay for residential care. As a result, the Dilnot recommendations wouldn't produce a fairer, simpler and more sustainable care system. His recommendations are fundamentally flawed - they would primarily protect the assets of wealthier older people and would not provide much-needed extra funding for the care of our ageing population. Furthermore they would make the complex care system even more complicated and create a new insurance industry with millions more financial transactions. The focus on Dilnot has meant little attention has been given to alternatives. But bringing health and care together could make much better use of scarce resources and give older people better care closer to or in their own home, rather than in residential care or hospital. While extra tax funding will be needed, we must also change how care is delivered. Helping people to help themselves as early as possible, rather than waiting for crisis, and supporting individuals to live with families in local communities would make a big difference. If implemented, the Dilnot proposals would change the architecture of care funding and would offer greater certainty for individuals as well as the opportunity for the development of insurance products that might allow people to reduce financial risk still further. There would be no losers from the Dilnot reforms. Therein lies the first problem - there is a cost to implementation and it is this that has prevented the government from going any further than supporting the proposals in principle. The second problem is that the Dilnot reforms would bring no new funding into the care system and the biggest challenge the sector faces is resourcing care and support for rising numbers of older and disabled people, as well as delivering on the vision for care and support set out in the recent White Paper. In my view the social care system is up against the wire, budgets are tight and reducing and inevitably something has to give whether it is time, quality, numbers supported or reducing spend on prevention. Yet the question of the level of funding needed to deliver care and support seems currently to be secondary to the Dilnot question. Both questions need an answer but if we don't find a way to increase the funding for care and support we will not be able to provide the level or quality of care that people need to maintain their dignity and their independence. Social care is possibly the only vital public service where people can face a potentially limitless financial liability. One in 10 of us will need at least £100,000 worth of care in our retirement. Placing a cap on these costs as Dilnot recommended is a logical extension of the freedom from fear we already enjoy, thanks to the NHS, in relation to healthcare costs. We need to be clear the cap is a way of sharing the costs of care between the individual and the state in a way that is transparent and fairer than the current cliff edge - "the worst means test in the world", as Dilnot described it - which leaves people with very modest assets facing the prospect of huge bills. It would not resolve the bigger question of the total quantum of money needed to fund a decent level of care that would be acceptable for ourselves and our families - this was excluded from Dilnot's terms of reference. The level at which the cap is set will be shaped as much by the prevailing fiscal climate as any technical assessment of an optimum level. Currently the lower £35,000 limit proposed by Dilnot looks too low and a figure of £50,000 to £70,000 more realistic. This would be based on local authority care rates, not what people might choose to pay - the state is not about to bankroll five-star nursing home bills and the biggest challenge will be persuading the Treasury to pick up the tab at any level.